What is Taste of the Wild Pacific Stream Grain-Free Puppy Food? 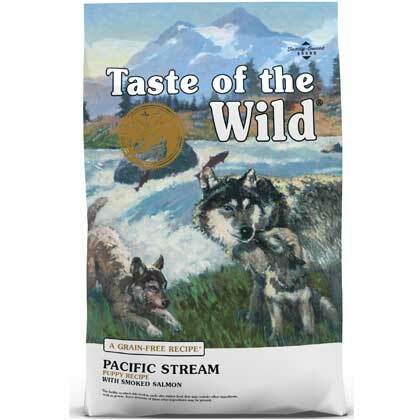 Taste of the Wild Pacific Stream Grain-Free Puppy Food is a hearty formula for growing puppies. It contains a blend of fish protein sources for an amazing taste, plus fruits and vegetables that deliver antioxidants for a healthy lifestyle. Along with antioxidants, Taste of the Wild Pacific Stream Grain-Free Puppy Food contains omega fatty acids and DHA for healthy growing brains and organs. In addition, Taste of the Wild Pacific Stream Grain-Free Puppy Food is grain-free, which means no corn, wheat, soy, or fillers that can aggravate allergies. Each batch of Taste of the Wild is cooked with water that is purified through reverse osmosis, the same process used by popular bottled water manufacturers. This helps to remove any microorganisms, organic and inorganic chemicals, and ensures the meats and meat meals are steamed (cooked) with purified water. Taste of the Wild provides your puppy with a hearty meal that is not only delicious but also provides essential vitamins and antioxidants to stay healthy and active. Days 1 & 2: Feed 75% previous puppy food and 25% Taste of the Wild. Days 3 & 4: Feed 50% previous puppy food and 50% Taste of the Wild. Days 5 & 6: Feed 25% previous puppy food and 75% Taste of the Wild. Ingredients: Salmon, ocean fish meal, sweet potatoes, potatoes, peas, pea protein, canola oil, tomato pomace, smoked salmon, salmon meal, natural flavor, salmon oil (a source of DHA), salt, choline chloride, natural mixed tocopherols, dried chicory root, yucca schidigera extract, tomatoes, blueberries, raspberries, dried Enterococcus faecium fermentation product, dried Lactobacillus acidophilus fermentation product, dried Lactobacillus casei fermentation product, dried Lactobacillus plantarum fermentation product, dried Trichoderma longibrachiatum fermentation extract, vitamin E supplement, iron proteinate, zinc proteinate, copper proteinate, ferrous sulfate, zinc sulfate, copper sulfate, potassium iodide, thiamine mononitrate (vitamin B1), manganese proteinate, manganous oxide, ascorbic acid, vitamin A supplement, biotin, niacin, calcium pantothenate, manganese sulfate, sodium selenite, pyridoxine hydrochloride (vitamin B6), vitamin B12 supplement, riboflavin (vitamin B2), vitamin D supplement, folic acid. * Not recognized as an essential nutrient by the AAFCO Dog Food Nutrient Profile. Taste of the Wild Pacific Stream Puppy Formula is formulated to meet the nutritional levels established by the AAFCO Dog Food Nutrient Profiles for All Life Stages.